A pearl creates its own splendour. 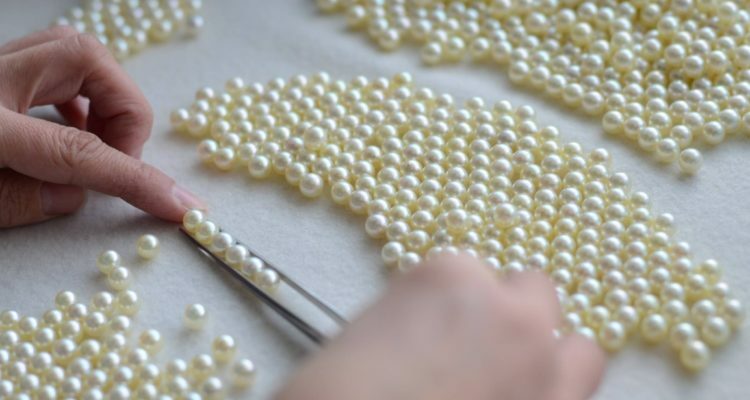 The creation of a pearl is a fascinating process that requires a great deal of time and care. Gemmologists classify pearls in general as coloured gems of organic origin that are formed by some types of oysters in sea water, and by some fresh water shells. South Sea pearls are entirely formed out of natural pearl material called nacre, which surrounds a small nucleus that is inserted in the vital parts of an oyster. South Sea pearls are the largest pearls with the thickest nacre. They are the most precious as they are the most difficult to produce. The oyster that hosts these pearls is the Pinctada Maxima that lives in the warm, calm, pure blue waters of the South Seas. There are two prerequisites for the production of nacre: an uncontaminated environment that is rich in plankton, and an oyster of considerable size. When conditions are favourable, oysters tend to accept larger nuclei and can be inseminated up to three times. In addition to a notable size, the Pinctada Maxima oyster endows these pearls with a very thick nacre, a velvety opalescence and an indefinable range of colours. 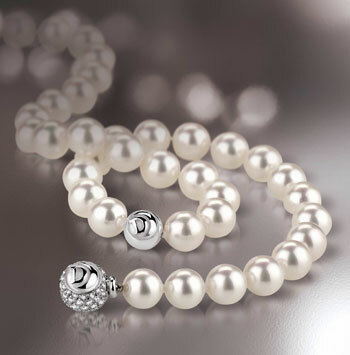 It takes about 24 months for pearls to reach a diameter of 10 to 18 mm. The silver-lipped Pinctada Maxima oyster will almost always produce silver white pearls with pink, grey or green hues, while the gold-lipped type gives rise to yellow or gold gems. They are produced in the geographical area that extends from the Burmese coast to the coasts of northern Austalia. 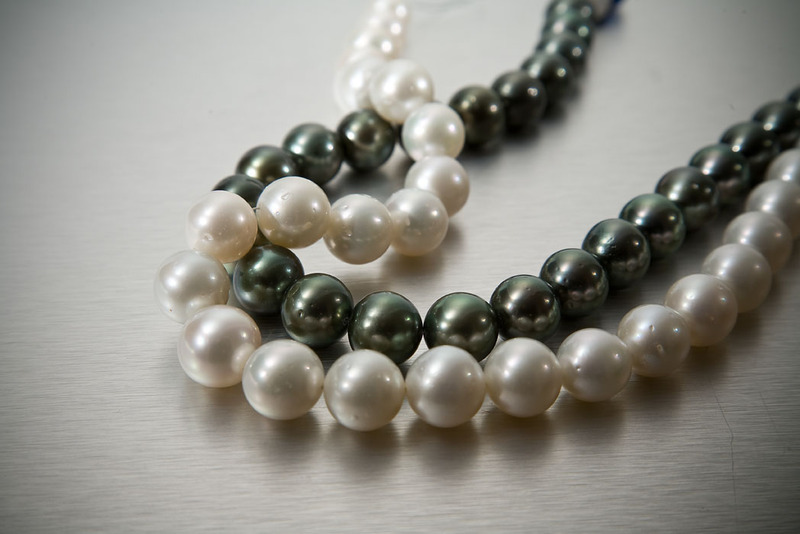 The original colour of these pearls is very dark. They are formed in black-lipped oysters known by the name Pinctada Mergaritifera. They are cultivated all over Polynesia. They have a diameter that varies between 8 and 14 mm. Very rarely these pearls can reach a diameter of up to 16mm or even 17mm. They come in an immense variety of shades that range from dark grey to jet black. 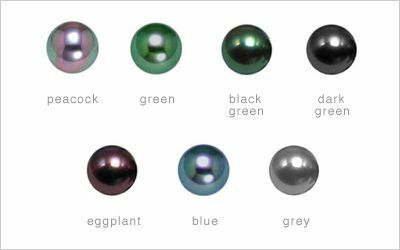 Utopia’s classification criteria for Tahitian pearls are the same as those for South Sea pearls. Absolutely the most known and commercialized pearls thanks to their typically very high quality. The nurseries of these productions are located in the south of Japan, near the Ryu-Kyu islands in Okinawa, in the Shikoku and Kyushu islands; other cultivation centers are located near Kobe, Kyoto and in the bays of Ago and Ise. The mollusc used is the Pinctada Martensi, also called Akoya and grows at a temperature between 18 ° C and 25 ° C. The formation of the pearling is 0.15-0.30 mm per year and the cultivation period lasts between 1 and 3 years. The diameter of the core used for the creation of this pearl varies between mm and 8 mm. 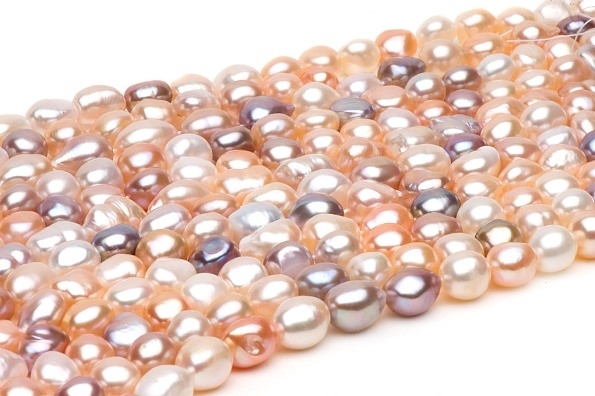 Pearls have a size that usually ranges from 2 to 10 mm, rarely higher. The color is typically white, pink, cream and with various shades. Gray pearls are very rare. You can find many shapes: pear, pear, baroque, oval, spherical. The fresh water pearls are those commonly called “river” or “freshwater” and appeared on the international market in the late ’50s. The best known were in the past from Lake Biwa, in Japan (this production was exhausted immediately due to the high rate of water pollution that no longer allowed cultivation). Later, and currently, most of the cultured pearls come from China (and to a lesser extent from Vietnam). 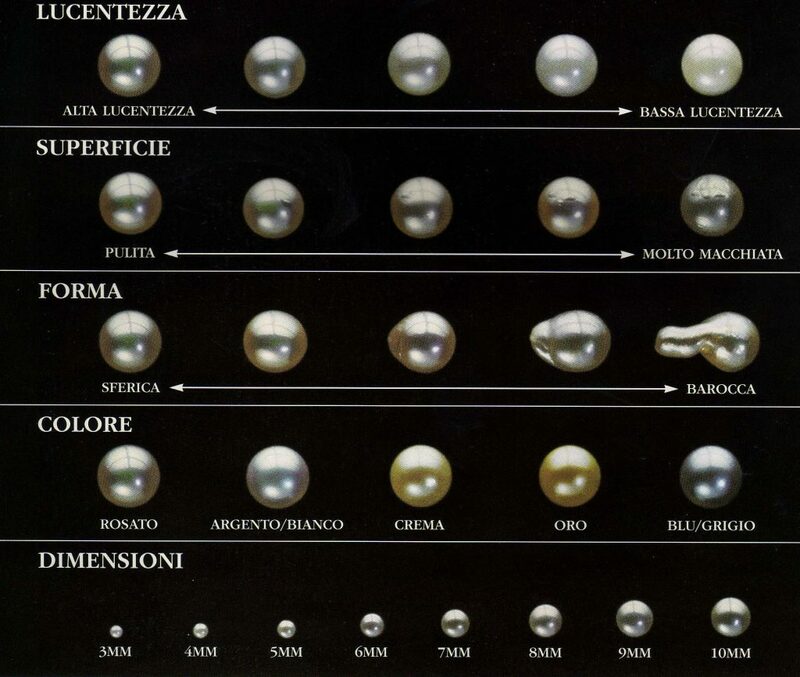 The cultivation times of these pearls are from about 9 to 24 months; the molluscs are the Hyriopsis Schlegeli in Japan and the Cristaria Plicata in China and Vietnam. In the 80s the cultivation of Unio molluscum in the United States (Texas and Tennessee) began. 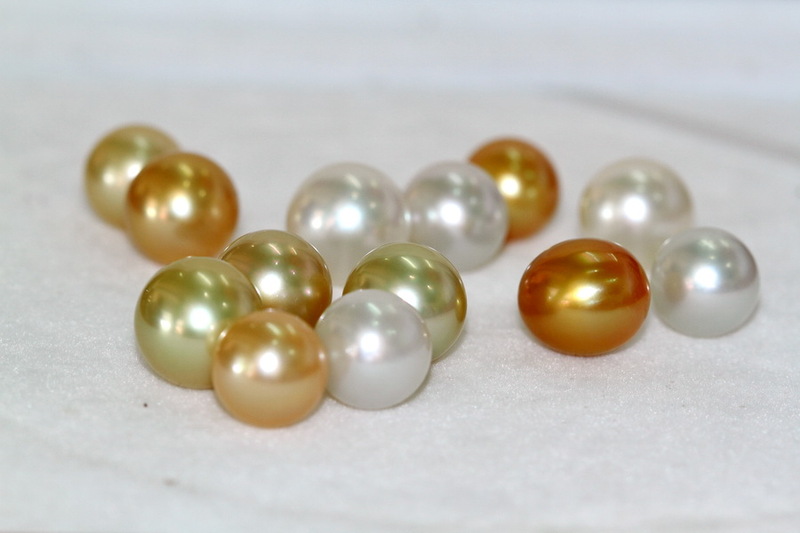 The freshwater pearls are generally of irregular shape, baroque and ovaloid (similar to a grain of rice), although in the last 5 years the productions have become of excellent quality also with regard to the perfectly spherical shape. They are presented with white-cream colors with possible shades of orange, pink and bronze. 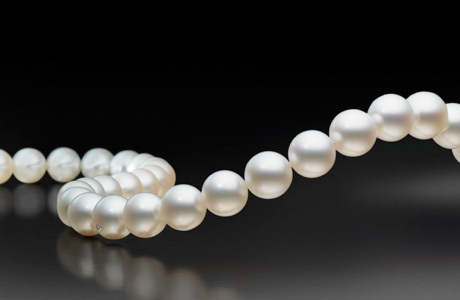 They present a pearly appearance rarely similar in gloss to that of Japanese and South Sea cultured pearls, this means they are less precious.